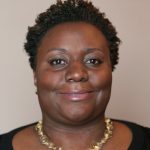 Shaquila Myers is the Legislative Director for Senate Minority Leader Jim Ananich, working on a number of important public policy issues including the ongoing Flint water crisis. Prior to working for Sen. Ananich, Ms. Myers worked as a Policy Analyst for the Michigan Senate Democratic Caucus working on Health Policy, Transportation, and Capital Outlay Committees for seven years. In her time with the caucus, she played a key role in several major health initiatives, including the expansion of Medicaid under the Affordable Care Act that currently provides healthcare for more than 600,000 Michigan residents. Ms. Myers is well-respected on both sides of the aisle and has worked on every aspect of the legislative process, from research and development, bill drafting and providing testimony to negotiating amendments and securing bill passage. Ms. Myers was born and raised in Detroit and a proud product of Detroit Public Schools. She graduated from Oakland University with a Bachelor of Science in health science and a Master of Public Administration. As part of her master’s program, Ms. Myers promoted community health awareness and voter access. She is devoted to service and mentorship as outreach coordinator for the Chi Iota Zeta Chapter of Zeta Phi Beta Sorority Inc. Ms. Myers lives in Lansing, but is an avid traveler who believes that changing the world is best informed by seeing it.